Chronic daily headache is a group of disorders that are common and seen frequently in the healthcare setting. Along with the disability associated with frequent headaches, chronic daily headache has comorbid conditions that can increase disability and decrease life satisfaction. Understanding and managing these comorbid conditions are important, not only to improve the quality of care we provide to persons with chronic daily headache but to help reduce disability. This chapter will review common comorbidities seen with chronic daily headache such as mood disorders, musculoskeletal disease, head trauma, epilepsy, stroke, sleep disorders, asthma and allergies, thyroid dysfunction, obesity, and cardiovascular disease. We will also highlight potential reasons for the coexistence of these disorders. Ramadan NM, Silberstein SD, Freitag FG, Gilbert TT, Frishberg BM, Consortium UH. Evidence-based guidelines for migraine headache in the primary care setting: pharmacological management for prevention of migraine. 2000. http://www.aan.com/professionals/practice/pdfs/gl0090.pdf. Thorpe KE. Prevalence, health care spending and comorbidities associated with chronic migraine patients. The Headache & Migraine Policy Forum. 2017. 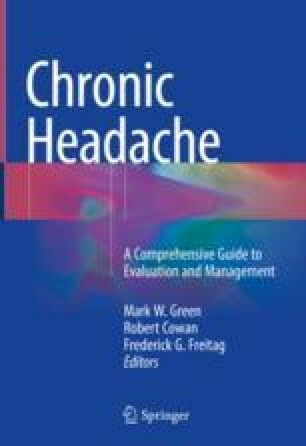 Accessed 14 Feb 2017. https://www.headachemigraineforum.org/resources?category=Policy+Papers.